When Jesperi Kotkaniemi stepped on the ice Wednesday night, he became a small piece of NHL history. The Montreal forward became the first player born in the year 2000 to play in a regular-season game as the Canadiens opened the 2018-19 season at Toronto. When Jesperi Kotkaniemi stepped on the ice Wednesday night, he became a small piece of NHL history. The Montreal forward became the first player born in the year 2000 to play in a regular-season game as the Canadiens opened the 2018-19 season at Toronto. 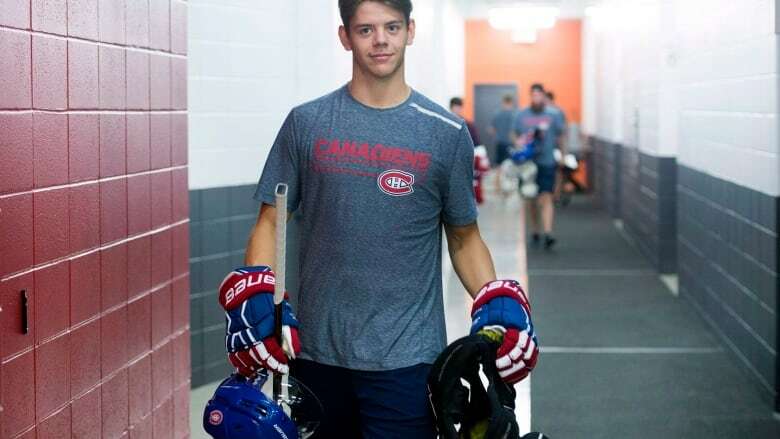 Even though Kotkaniemi — who turned 18 in July — was the youngest player skating at Scotiabank Arena, it didn't show. He had an assist in 15:05 of ice time as the Canadiens lost to the Maple Leafs 3-2 in overtime. Kotkaniemi said he had "no butterflies" playing in his first NHL game. "It was fun," said Kotkaniemi. "I enjoyed every moment even though the result isn't what we wanted." Kotkaniemi earned his first-ever NHL point on the power play, assisting on Andrew Shaw's goal that tied the game 2-2 just before the second intermission. The goal deflated the Maple Leafs, who struggled through the third period before Auston Matthews scored in overtime. "I don't think he looked out of place," said Canadiens head coach Claude Julien. "If you want to win hockey games you have to put players that are capable of making some great plays and creating some offence in a good position and he's certainly one of those guys." Kotkaniemi was Montreal's third overall pick in the 2018 draft and will be a key piece in the Canadiens' ongoing rebuild. The six-foot-two, 185-pound centre from Pori, Finland, had 10 goals and 19 assists for Assat in his one professional year in Finland before joining the Habs. "I think what I saw from him tonight was a guy whose first experience was a good one, I thought he did well," said Julien. "But at the same time I know he's one of those guys that's going to continue to adjust himself like he's done since the beginning. "I thought he answered the call very well, but he's realizing too that things are closing quicker but he's going to adjust. I was really happy with how an 18 year old handled himself in his first game."